As I can't move on with two projects and the other is a slow crawl, I am looking to move on to the next one. However, I hate having unfinished kits around as they invariably get damaged and discarded. So that is why I am sitting here not modelling for the time being. I am tempted to start on the Airfix Buccaneer. In the doldrums - again! I appear to have hit a block at the moment. Having had a big burst of enthusiasm last month, it has all come to a halt. When I took the masking tape off the Sky, I managed to shear one of the wings off as well. It didn't go on the glue join, it was the actual plastic that sheared! I have sorted that and touched up the pain to it is now ready for decals. Decals - ah, yes. On the original decal sheet that came with the kit, there are two decals that go near to the jet intake on either side. What the decals say is "Keep Wheel All From Intake While Engine Is Running"! I bought a new set of ModelDecal decals to use - but I cannot find them! Hence this is on hold until they turn up. I am working on the wing fold but am not finding this easy to sort out. There are no realistic mounting points as the detailing is so accurate, nothing is strong enough to do the job. Plus, as there are three components, it is difficult to get the angles right. This is what a Gannet looks like with its wings folded. 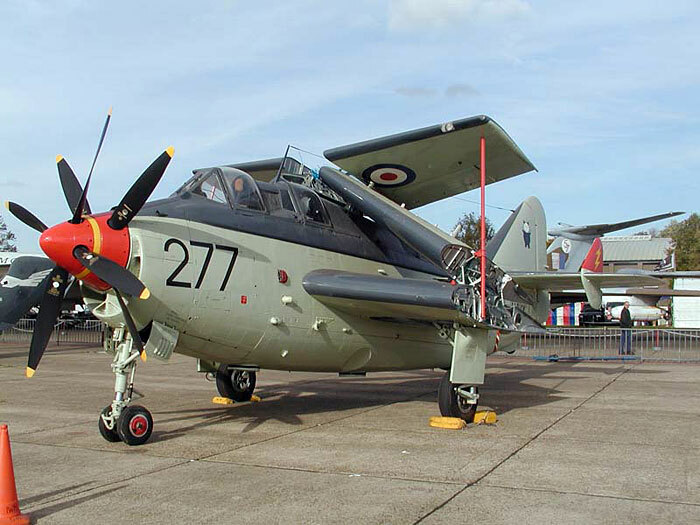 and here is a video of of the only flying Fairey Gannet - a T% based in the USA showing the wing fold in operation. It's a bit blurred but you will get the idea. For the Gannet, I am thinking of drilling some holes between the parts and putting some brass wire through. I will then bend every thing to the right angle and hopefully the brass wire will give it all some strength. I will have to make good on the wing surfaces which rather relies on me still having some of the paint mix I used for the RAF Blue Grey but onwards and upwards!